You can get a Free Autographed 8 x 10 photo of me (yippie!) . All that I ask is you help pay for shipping and handling costs as the Free photo is very popular. While you are there checkout other cool souvenir's and magic! Got back home late last night from Eldersburg Maryland. It was a really enjoyable Halloween Party and the people there were awesome. I had some time to get a plate of food and I am glad I did.. the baked macaroni and cheese was the best I ever had.. not to mention the fresh cookies. The show was awesome and I thank the kids for making the show memorable. 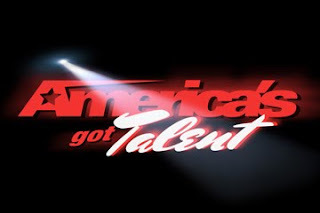 For the 2nd year in a row I've been asked by producers to audition on America's Got Talent. It would be nice for a magician to win but we are just not as mainstream as some of the acts who've won in the past. Rope Magic will astonish your audience and is easy to learn! Eddy Ray's teaching will take you step by step into the world of rope magic. Add over 30 Tricks & Tips to your arsenal! Check back every week for new deals! If you're interested in magic and want to join our community over there please register and start posting! Thanks to everyone who attended the book signing and performance at the Bernville Library this past Saturday October 24th. It was a ton of fun and was nice meeting people and seeing new faces. Join me on November 11th at the next signing and performance, located at the Womelsdorf Library. It's raining and the Halloweeen Hijnnx in Pottstown Pa has been cancelled, come back next year and see my show! Aside from that everything is still on track for tomorrow's book signing, (Saturday October 24th). 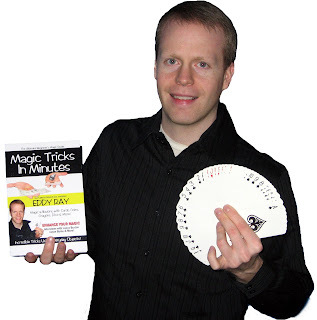 Join me at the Bernville Library starting at 10am for some magic and a book signing. Bring a friend! 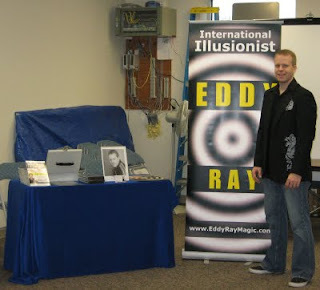 Join Eddy Ray at the Bernville Community Library Saturday October 24th at 10am for a Book Signing Event & Performance. Free to Attend! Womelsdorf Library on Wednesday November 11th at 6:30pm for a Book Signing Event & Performance. Free to Attend! 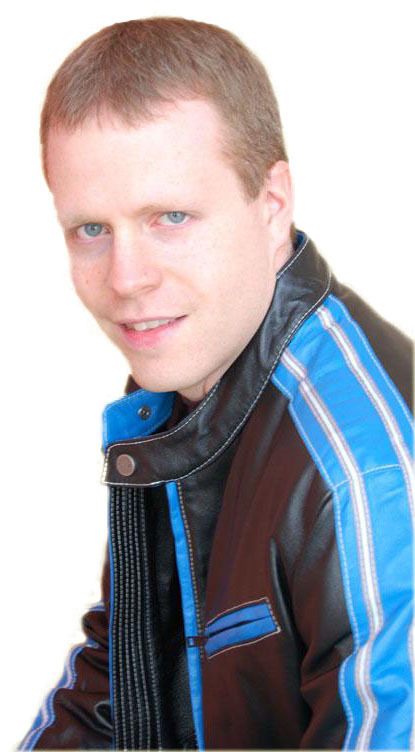 Jason Byrne was born in Fribourg, Switzerland and raised in Windsor, Ontario, Canada. He has performed all over Las Vegas and appeared on the Worlds Greatest Magic television specials. How did you first get started in magic? I first got interested in magic when I was five years old. My grandfather purchased a Marshall Brodien cardboard mirror box and gave it to me for Christmas. The following year I received a magic kit and then I was on to the Tarbell course of magic books. What are the positives and negatives about being a magician, and why? There are many great aspects being a magician. To lay people, you are a special person who creates what appear to be miracles and, in turn, brings some mystery to their life. We as magicians use magic to entertain and to make others feel good by giving them the unexpected—surprises. My favorite part of being a magician is creating and developing a trick or routine. The process of having an idea and making it come to life is the real magic for me. On the other hand sometimes being a magician can be frustrating. On occasion we are called upon to perform when we aren’t especially in the mood. From a full-time performers point of view there isn’t as much freedom as a hobbyist or part-time magician. It becomes a job like any other, especially when it comes to promoting and bookings. The part I dislike the most is when, performing aboard a cruise ship, you are easily accessible; and all too often you hear a man say: “Can you make my wife disappear while standing in the buffet line.” After the first few hundred times it becomes, shall we say, a little old. What is the hardest part of being a magician? In my opinion the hardest part of being a magician is being a good businessman. Having to depend on magic shows for your sole income is by no means an easy task. The percentage of full-time magicians is so small compared to those who do magic as a hobby or part-time, and those who make a very comfortable living are even fewer. Why is being original in performance art so important? The importance of being original has become more and more important. That isn’t to say that standard effects and routines don’t have a place, but the idea of being different from others is what helps sell in the world of business. Buyers, people are looking for new, something they have never seen. Being different is what makes you attractive and sought after. What is the most rewarding part of being a professional magician? The most rewarding part of being a magician for me is being able to travel and, at the same, time being compensated for it. My magic has taken me to places that most dream about but could never afford. Experiencing different cultures and food have added great pleasure in my life, and I’m forever thankful. What is one of the most memorable moments in your career to date? Any funny or weird stories? I don’t think I have just one memorable moment in my career, but I’d have to say that meeting Channing Pollock in New York at the Tannen’s Jubilee was an incredible moment. Getting to know him was even better. My definition of success is none other than being happy. Happy about what I’m doing and who I am. Being a variety act, do you feel magic and magicians are respected by society? That is a difficult question to answer. There are far more bad magicians than good ones, which donâ€™t necessarily help magic, gain respect. I think a lot of people view magic just above mime and or clowning; and it is obvious that sports, acting and music are the top industries when it comes to entertainment. However, I do think that great magicians are respected in their own right…and deserve to be. What advice can you give people who want to begin a career in the variety arts? The best advice I can offer is to get as much stage time as possible. Nothing can replace experience. Keep your eyes and ears open in order to learn. And follow your intuition. What message do you want to send to society about variety acts in general? Nothing really comes to mind regarding a message for society about Variety Acts. But, if I had to send any message to society in general, it would be to get out there and support live entertainment. Before Television existed, all entertainment was live. TV has taken over the world; and because it is fairly inexpensive and very convenient, people stay at home and become less social. Being social is important. You can only learn so much by being a viewer. Experience and education is what will help us develop as a society. I find TV entertaining as well, but the drawback is that there isn’t any interaction, and so there isn’t a pure connection. What ways can the general public support performance art? The only way I think the general public can support performance art is by purchasing tickets to see live shows. Every week there is a new deal added to my online magic store. I'm talking about great magic at a huge savings! Really, it's at least worth checking out to see what is updated every week! I came across this set of direct & simple, but very good party planning tips by Magician George Patrick. I am sure you will find some great advice!